OnePlus' first smartphone to feature a notch display design has just received its first important update. Although the OnePlus 6 is not yet available in all countries, those who managed to get their hands on one will now be able to update it with a couple of new features. The most important new addition to the OnePlus 6' set of features is the option to hit the controversial notch. There's a new toggle buried in the phone's settings, which will allow OnePlus 6 users to show/hide the notch as they see fit. Furthermore, the update adds support for slow-motion videos, which means OnePlus 6's camera will be able to shoot super slow motion videos at 720p@480fps and 1080p@240fps. In addition, the phone's camera now features support for quick capture in portrait mode. The OnePlus Switch application will be added after the update, as well as the May security patch and support for more actions for recently deleted files in the Gallery. OnePlus usually deploys these updates in waves, so a wider roll-out is likely to happen in the next couple of days, but the update is coming so make sure to check for its availability from time to time. It's funny. They make a notch and then give the option to hide it. No one is buying the S9 let alone Samsung devices in droves anymore (Chinese phones are really good now), and they're going straight for Apple now. Their notch has no significant tech under it, so there was really no reason to add it. Go figure. If you want to attract sales, copy Apple. OnePlus never hid the fact they look at Apple for certain things. But to say there was no reason is just plain short-sighted. There is tech behind it, just not as much as Apples phone. That is why the notch is a lot smaller than Apples too. Besides Chinese brands copy Samsung phones all the time too. It's what most Chinese brands do, look at the best selling devices and copy it. The first photo gave me an illusion that the phone got no chin. I even thought you guys used a fake photo, lol. It's great that you can hide the notch, as a lot of people aren't interested in a design where you constantly have to look at a design compromise that dips into the display. 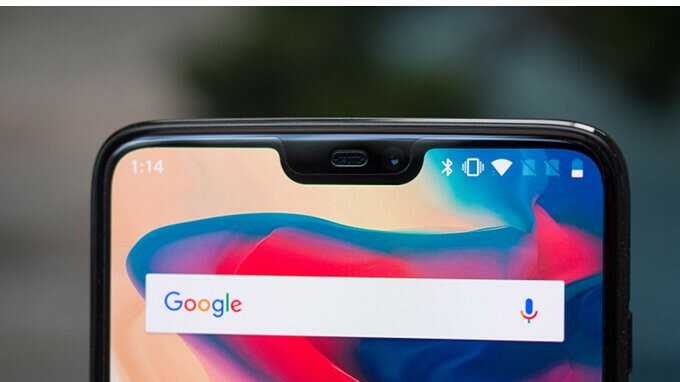 In Oneplus' defense, their notch is a lot less smaller and more subtle than the one on the iPhone X.